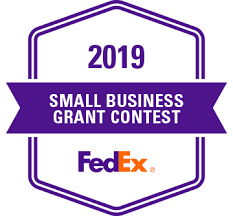 Vote for SLC Consulting for the FedEx Small Business Grant 2019! I hope that this message finds you well and that you’re enjoying the slow thaw from winter into spring. SPSN is working hard on a variety of written products and digging deep into research. I wanted to let you know that SLC Consulting is in the running for a FedExSmall Business Grant this year. SLC consulting is my consulting firm that supports both the Project to Strategically Protect Soft Networks and First Amendment Voice. SLC has been a National Symposium sponsor for students for the last two years, in addition to hiring SPSN researchers. If we win, SLC will split the grant money between First Amendment Voice for the National Symposium and SPSN. The FedEx Small Business Grant recognizes and rewards unique small businesses with an amazing story to tell. Grants range between $18,000 and $50,000, which would be incredibly beneficial to our ongoing work, and would improve our ability to hire high-quality researchers and host informational and collaborative events. Thank you for your consistent and ongoing support for this project. Your support on this initiative and others helps us and our partners better protect soft networks. This entry was posted in Uncategorized by protectingsoftnetworks. Bookmark the permalink.